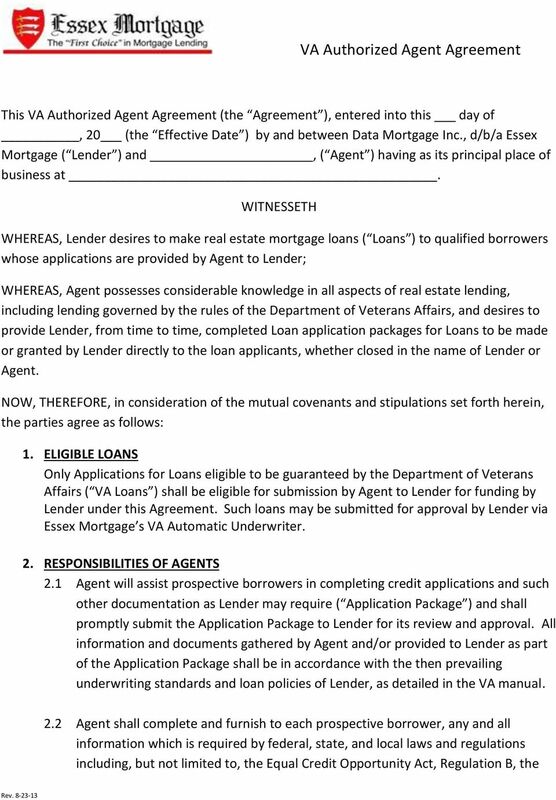 Download "VA Authorized Agent Agreement"
3 4.5 Agent and each of its officers, directors, agents and employees maintain all licenses required of them; 4.6 Agent has no adverse information concerning an applicant which it has not communicated to the Lender; 4.7 Except for the payment to satisfy an existing loan, no fee or other compensation or any portion of the loan proceeds has been or will be paid directly or indirectly by any person to Agent or any of its officers, directors, employees or agents; 4.8 The loan has not been referred to or brokered to Agent by another correspondent or mortgage broker; 4.9 No fee or other compensation has been or will be paid to Agent in connection with Lender s insurance requirements or any loan or sale escrow; 4.10 Except for the payment to satisfy an existing loan, the loan proceeds are not to be paid, in whole or part, to a seller who (1) pays any compensation to or receives any compensation from Agent, (2) is related by common ownership or control to Agent, or (3) shares its profits or losses with Agent. 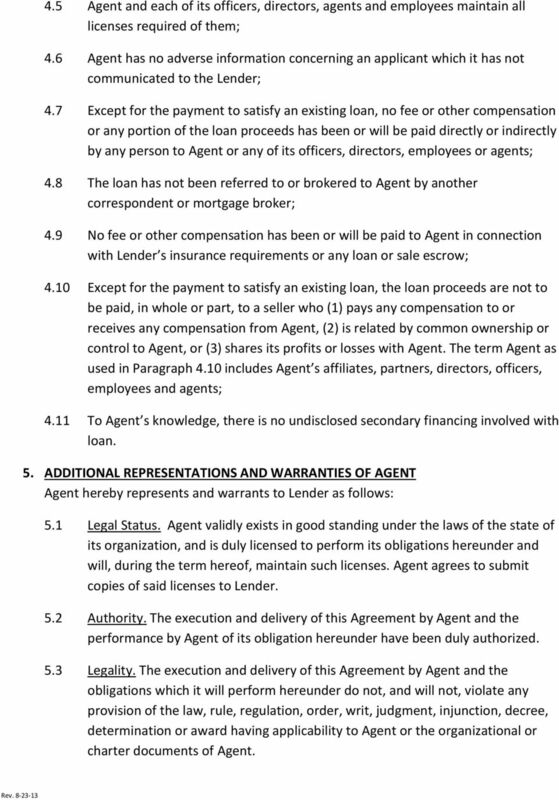 The term Agent as used in Paragraph 4.10 includes Agent s affiliates, partners, directors, officers, employees and agents; 4.11 To Agent s knowledge, there is no undisclosed secondary financing involved with loan. 5. 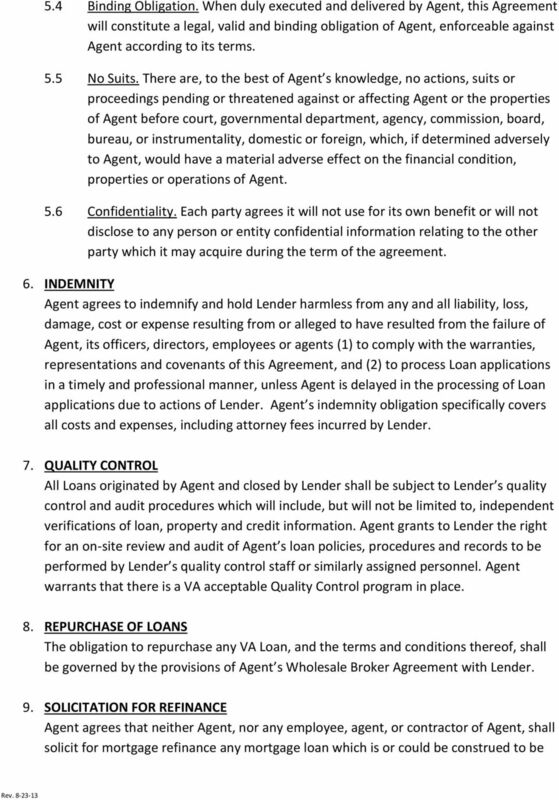 ADDITIONAL REPRESENTATIONS AND WARRANTIES OF AGENT Agent hereby represents and warrants to Lender as follows: 5.1 Legal Status. Agent validly exists in good standing under the laws of the state of its organization, and is duly licensed to perform its obligations hereunder and will, during the term hereof, maintain such licenses. Agent agrees to submit copies of said licenses to Lender. 5.2 Authority. The execution and delivery of this Agreement by Agent and the performance by Agent of its obligation hereunder have been duly authorized. 5.3 Legality. 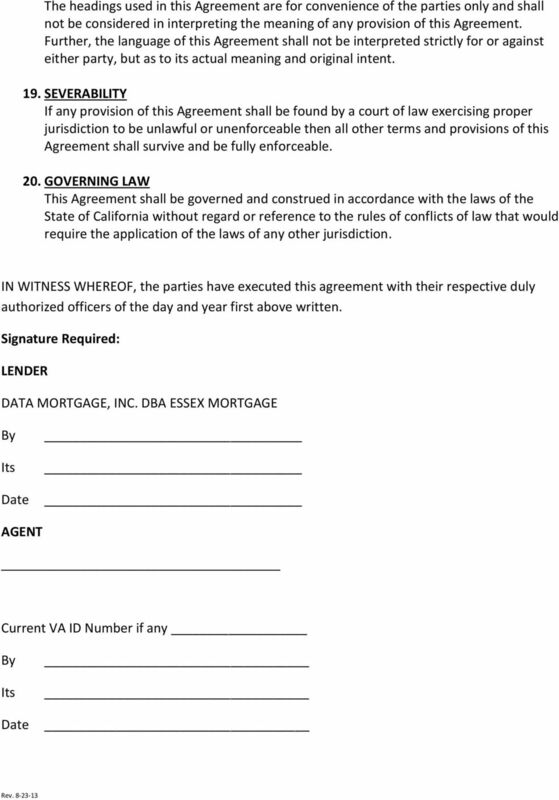 The execution and delivery of this Agreement by Agent and the obligations which it will perform hereunder do not, and will not, violate any provision of the law, rule, regulation, order, writ, judgment, injunction, decree, determination or award having applicability to Agent or the organizational or charter documents of Agent. 5 subject to this Agreement. Loans closed by Lender cannot be solicited by Agent, or an employee of Agent, for a period of 120 days from the date the loan is closed by Lender. 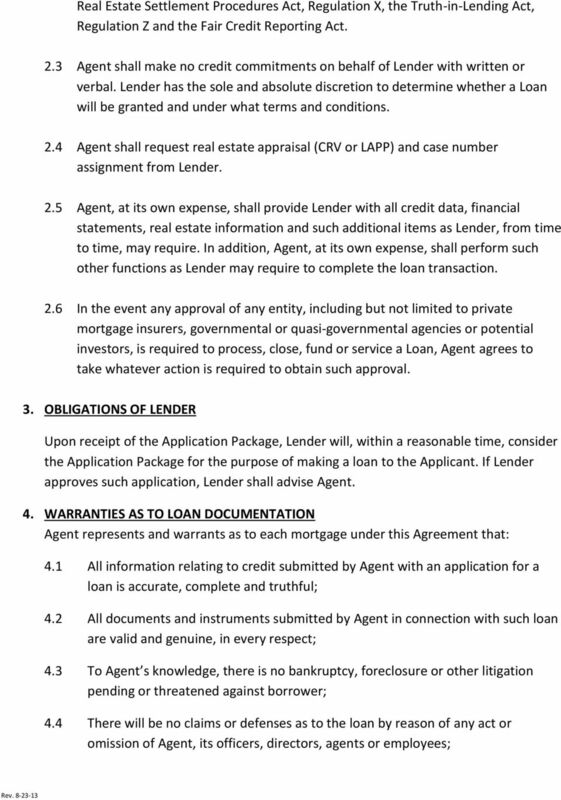 In the event Agent breaches this covenant, Agent shall pay to Lender within two days of Agent s receipt of notice from Lender an amount equal to one percent (1%) of the then outstanding principal balance of the loan. 10. 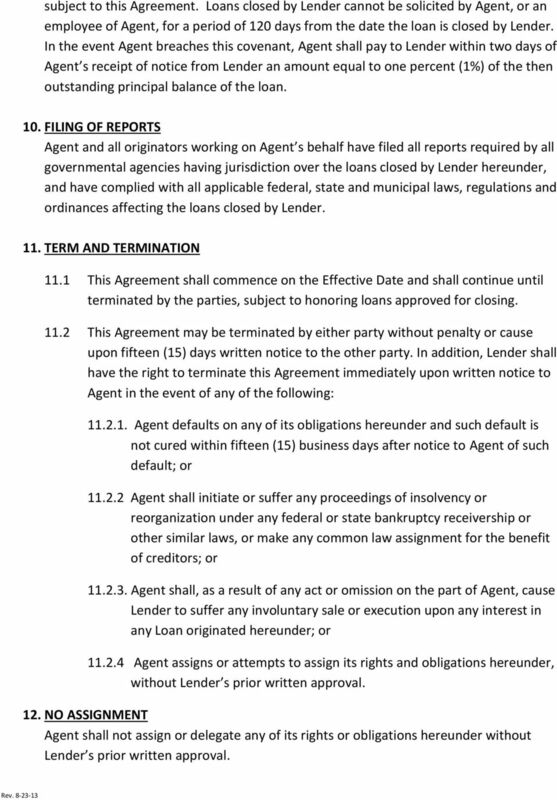 FILING OF REPORTS Agent and all originators working on Agent s behalf have filed all reports required by all governmental agencies having jurisdiction over the loans closed by Lender hereunder, and have complied with all applicable federal, state and municipal laws, regulations and ordinances affecting the loans closed by Lender. 11. TERM AND TERMINATION 11.1 This Agreement shall commence on the Effective Date and shall continue until terminated by the parties, subject to honoring loans approved for closing This Agreement may be terminated by either party without penalty or cause upon fifteen (15) days written notice to the other party. 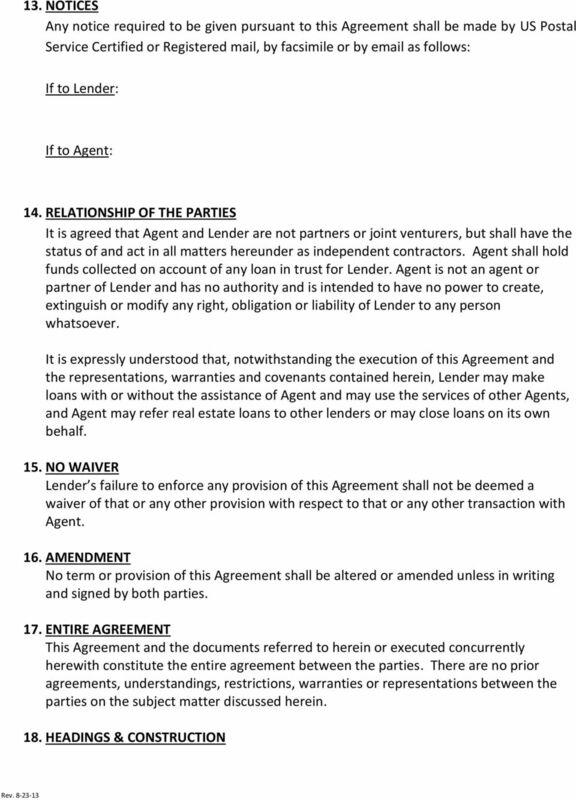 In addition, Lender shall have the right to terminate this Agreement immediately upon written notice to Agent in the event of any of the following: Agent defaults on any of its obligations hereunder and such default is not cured within fifteen (15) business days after notice to Agent of such default; or Agent shall initiate or suffer any proceedings of insolvency or reorganization under any federal or state bankruptcy receivership or other similar laws, or make any common law assignment for the benefit of creditors; or Agent shall, as a result of any act or omission on the part of Agent, cause Lender to suffer any involuntary sale or execution upon any interest in any Loan originated hereunder; or Agent assigns or attempts to assign its rights and obligations hereunder, without Lender s prior written approval. 12. NO ASSIGNMENT Agent shall not assign or delegate any of its rights or obligations hereunder without Lender s prior written approval. THIS AGREEMENT is entered into in the State of California this day of 2006, between Crestline Funding Corporation, hereinafter referred to as Crestline Funding, and, hereinafter referred to as Broker. First Source Capital Mortgage, Inc.
BUSINESS PARTNER AUTHORIZATION CHECKLIST Thank you for choosing Direct Commercial Funding, Inc., Where Funding Never Stops. The Authorization documents listed below must be completed prior to closing. ALTERATIONS, MODIFICATIONS OR AMENDMENTS ARE ACCEPTED TO THIS AGREEMENT. BROKER AGREEMENT. A. Broker is engaged in the business of originating, processing, and pre-underwriting Loans. WCS Funding Grp, Inc Dba/HappyMortgage 4405 Leeds Avenue Baltimore, MD 21229 Re: Reverse Mortgage Broker Application Dear Broker: Thank you very much for your interest in partnering with WCS Funding Grp. CLS Investments, LLC Instructions for the Solicitor Application and Agreement Please complete all fields on page 1 of the Solicitor Application and Agreement. Some general guidelines are set forth below. Are you a Table Funding Partner? Are you a Correspondent? Below is an overview of the Molex lease process as it applies to Molex Application Tooling equipment. Dear Valued Customer, Below is an overview of the Molex lease process as it applies to Molex Application Tooling equipment. Lease process: Molex does not offer leases for all of the equipment that we promote. Bookkeeping Services Agreement THIS BOOKKEEPING SERVICES AGREEMENT (the Agreement ) is made and entered into this day of, 20, by and between Susan Arnoldussen, of Accounting Unlimited, LLC (the Bookkeeper. Federal Tax ID # Employer ID# Credit Amount Requested: $ NOTE: Signed original application must be on file to activate your account. AMENDED AND RESTATED GUARANTEED INVESTMENT CONTRACT. by and among RBC COVERED BOND GUARANTOR LIMITED PARTNERSHIP. as Guarantor LP. U.S. BANK N.A. WHOLESALE MORTGAGE PURCHASE AGREEMENT RECITALS. All capitalized terms used in this Agreement shall have the meaning set forth below.